Hey everyone! I hope you all had a wonderful Easter (for those of you that celebrate it). We had a fabulous week. My parents made the trip to St. Paul to take care of our kids, while Radd and I took a quick trip to Chicago. We went to see the rock band The National play at the Chicago Theater. We’re slightly obsessed with this band. In fact, I’d go so far as to say they’re the best band of all time. I know that’s a bold statement, but I stand by it. So there’s my little musical recommendation for you. Chicago was fabulous and so was time away with my husband. The kids were spoiled by their grandparents, so everyone was happy. Let’s be honest, vacationing usually includes throwing caution to the wind and eating whatever one wants. We did that. And we drank too many craft beers and cocktails. Getting back on track is always in order when we return home. I’ve been eating lots of salads this week. 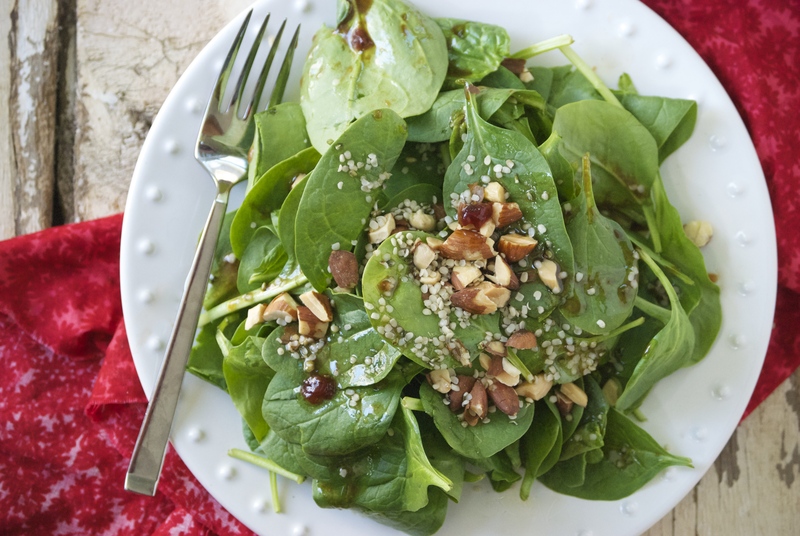 I had a few spinach salads with this strawberry balsamic vinaigrette and it is– as my five-year old would say “Amazin!” I’m always hesitant about posting such easy recipes on my blog (this dressing only contains 3 ingredients). I generally figure that everyone already makes it or uses this trick. My sister-in-law (whom I chat with everyday on the phone) assures me that is not the case. I was telling her about this dressing and I think she’ll be making it very soon. I usually make this dressing when my jam jar is pretty much empty, but there is still a slight film of jam in it. I hate to waste, so I pour in some good balsamic vinegar and a splash of good olive oil, put the lid on, and give it a shake. Voilà! Out comes this delicious vinaigrette. The strawberry jam and balsamic vinegar are a match made in heaven–cherry works great, too. Of course you don’t have to wait until you’re nearly out of jam. And you certainly don’t have to make just one portion, as I’ve given in this recipe. Make a jar of it– it’ll keep well in your refrigerator. 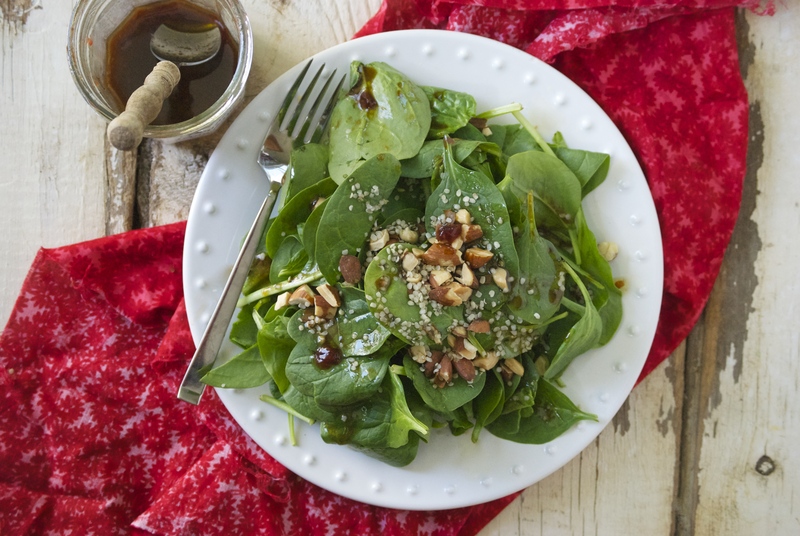 It’s great poured onto spinach and topped with chopped almonds and hemp seeds, or whatever you happen to fancy. Enjoy! Combine ingredients in a jar and shake. Season with salt and pepper, if necessary. And add a bit more olive oil, if you prefer it less vinegary. Increase amounts for a larger portion size. Store extras in the refrigerator. Toss with fresh spinach. Top with chopped almonds, hemp seeds, or even blue cheese, if desired. Thanks for stopping by Relishing It today! I just returned from my nine-hour-each-way road trip to North Dakota. I do my best to eat healthy when I travel, but sometimes I end up failing miserably. This trip I had a hard time saying no to the most delicious bacon cheeseburger in the universe– again. And it went downhill from there. Now I’m making up for my gluttony by trying to eat my weight in vegetables, and today’s post is a good start. 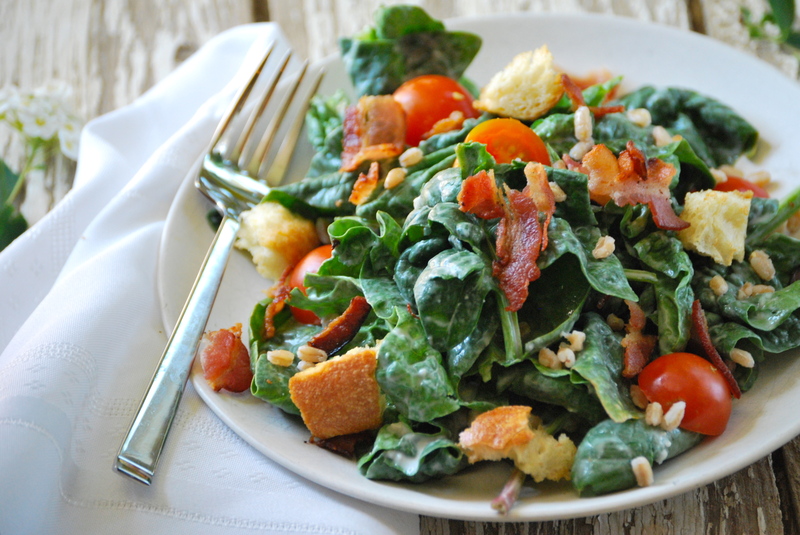 I’ve been craving a crisp spinach salad for awhile now. Not the pre-packaged spinach that has “bag smell”, but fresh garden spinach that you can find at almost every farmers’ market. I’m talking about the kind that is curly, has loads of wrinkles, and personality. And although tomatoes aren’t quite in-season here in Minnesota, I knew I could get a few greenhouse-grown beauties. Along with the veggies, I wanted a few crunchy bacon crumbles– not much, just a enough to add a nice saltiness. Since I was thinking about a salad that could serve as a complete meal, I mixed in a whole grain. You’ve probably noticed that I do this a lot with my salads. This one and this one are two earlier favorites. This time around, I chose farro. It comes from the wheat family and has a nice, toothsome bite. 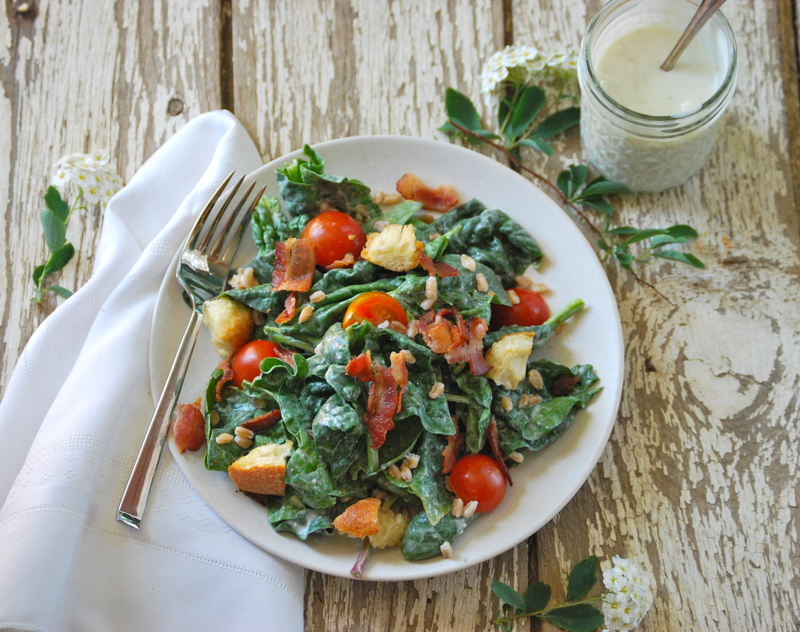 Finally, I wanted to bring it all these fresh ingredients together with a creamy gorgonzola dressing. I know there are a many of you that purchase bottles of salad dressing from the grocery store. My goal for today is to convince you to start making your own for every salad. It’s easy, and tastes amazing. No preservatives, and you know exactly what is going into your dressing. Plus, you can play around with the ingredients. 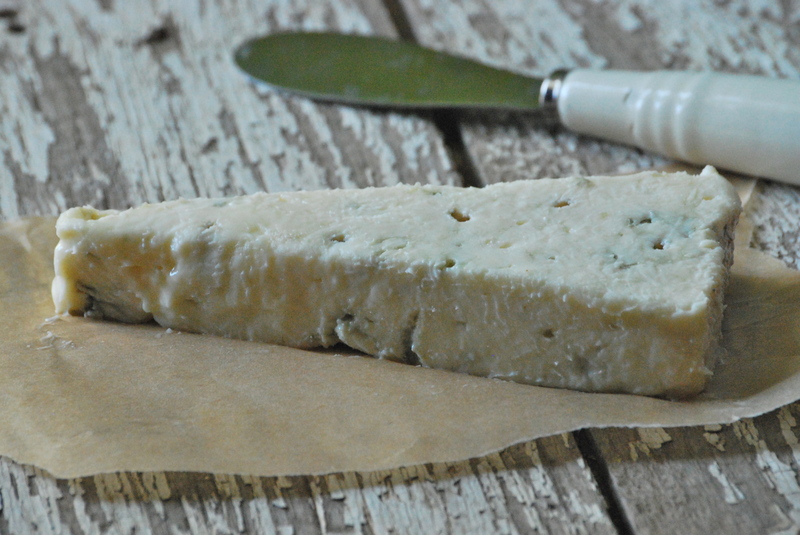 Switch out the gorgonzola for blue cheese. 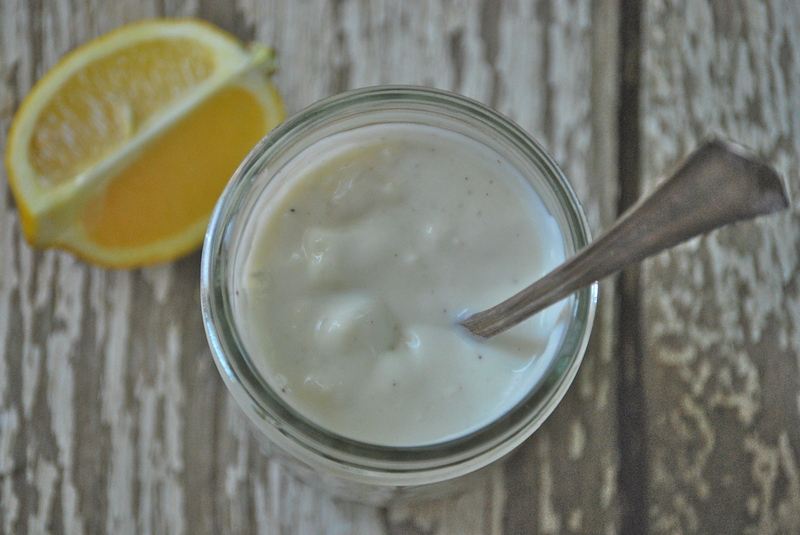 If you have extra yogurt on hand, use that instead of the buttermilk. Just give it a try. I’m guessing you’ll like it enough that you won’t buy bottles again. This particular dressing is simple and beautiful. One last note about Spring spinach. You’ll need to clean it thoroughly– more than just a spray of water and throwing it in the salad spinner. Instead, soak it in a large bowl of cold water for a minute or so to allow the dirt to settle to the bottom. You don’t want to ruin this beautiful salad by biting into a fresh green leaf that still has dirt hidden in one of the folds. Enjoy! To start, rinse the farro in a mesh strainer. Place the farro in a small saucepan and cover with water by about an inch. Bring water to a boil, then reduce to a small/medium simmer. When the farro is tender, but still has a toothsome bite to it, remove from the heat — about 15-20 minutes. Pour into a strainer and let cool. Preheat oven to 350°F. Prepare the homemade croutons by cubing about 1/4 of a fresh or day old baguette. Place on a baking sheet and drizzle with a bit of olive oil (about 2 teaspoons) and a sprinkle of salt and pepper. Toss to coat. Place in the oven and toast for about 10-15 minutes, stirring a couple of times. They are done when they are golden brown and have a nice crunch to them. Prepare the dressing by placing the gorgonzola cheese in a medium-sized bowl. Add the buttermilk. Mash with a fork until it is mostly incorporated. Be careful to leave some small chunks of cheese, as it adds to the texture of the dressing. Add a squeeze of lemon and salt and pepper, to taste. Set aside. Fill a large bowl with cold water. Place the spinach in the bowl and swish it around a bit, then leave it alone. All the of the dirt will sink to the bottom. Gently remove the spinach and place in a salad spinner. Give it another rinse with running water and then spin it dry. 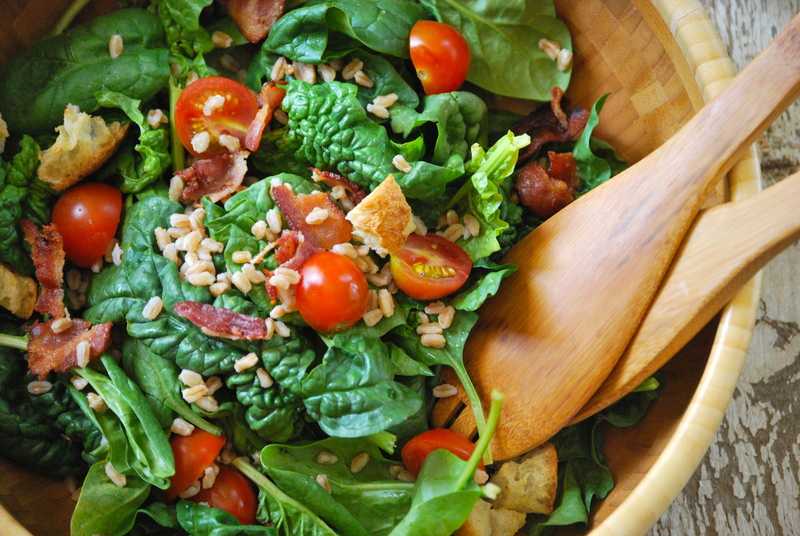 In a large salad bowl, place the spinach, tomatoes, farro, and bacon. Pour some of the dressing on it. Toss and top with croutons. Enjoy! Thanks for stopping by Relishing It — have a lovely day! I don’t believe I’ve mentioned my love affair with farmers’ markets here in previous articles. The entertaining Mill City Farmers’ Market (for delicious vendor fare and people watching) and the amazing St. Paul Farmers’ Market (for fresh produce and locally-sourced meat and eggs) are my happy places. I absolutely love being surrounded by all of that fresh, healthy, vibrant produce, as well as visiting with the local farmers about their offerings. Our family’s weekend adventures almost always start with a trip to the market. I’m glad it’s a tradition that my kids will carry with them, even if at their ages, they have to be bribed with the promise of kettle corn. This dish is an example of how I try to incorporate my farmers’ market purchases into what we eat a few nights of the week during Summer. 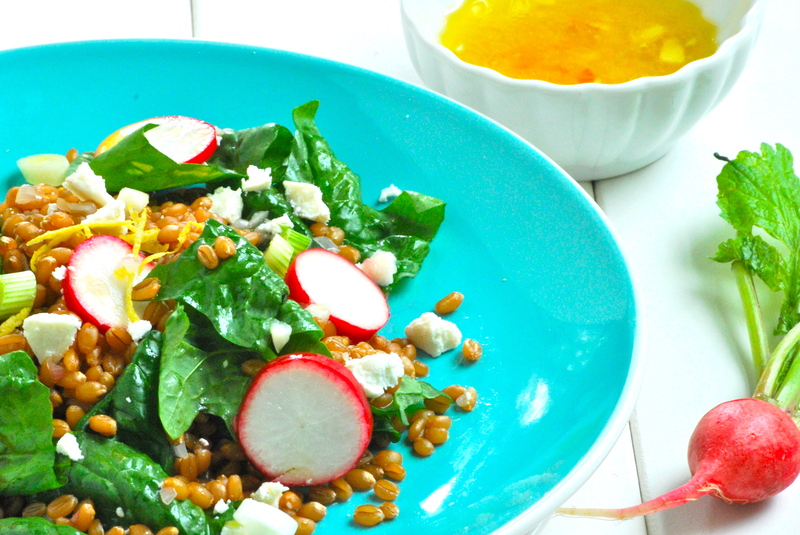 I’m a grain enthusiast, so I chose wheat berries for this salad. 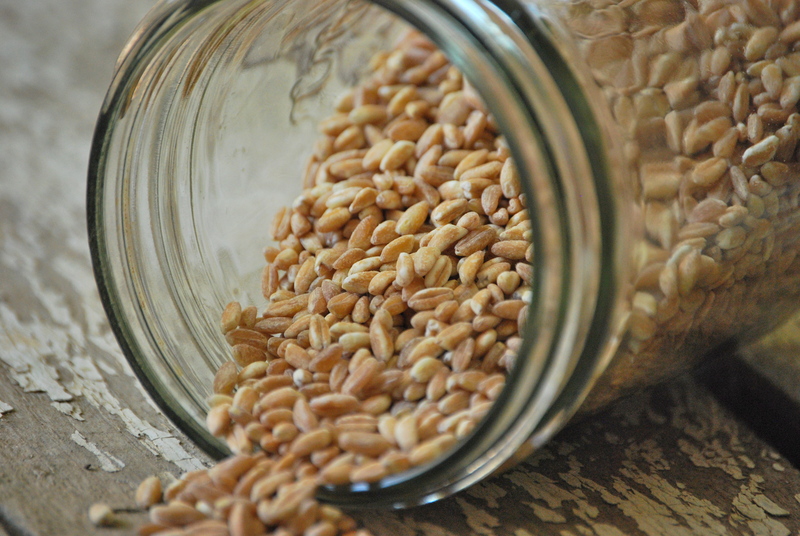 Wheat berries are the entire delicious wheat kernels with the hulls removed. They are firm, chewy, and “toothsome”, and really add heft here. You can soak them over night and boil them the next day for softening, or just boil them longer when you are ready to make your dish. 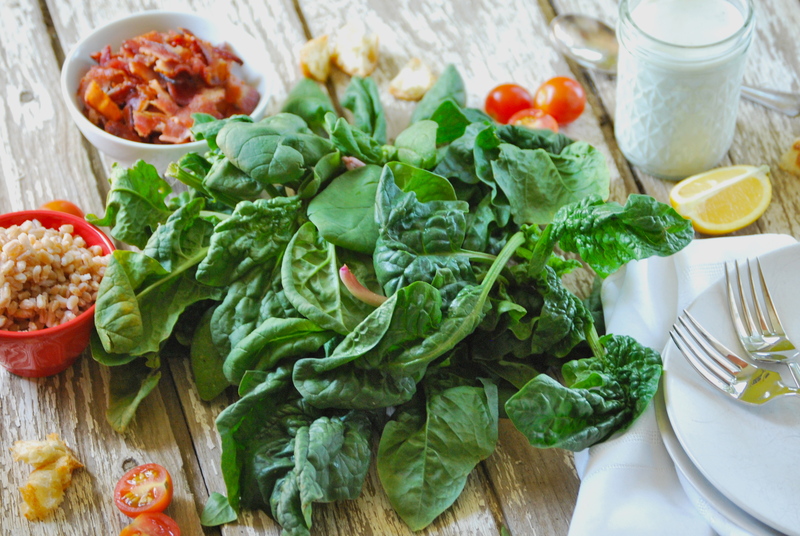 Fresh, garden-grown spinach is abundant right now and pairs beautifully with the wheat berries. 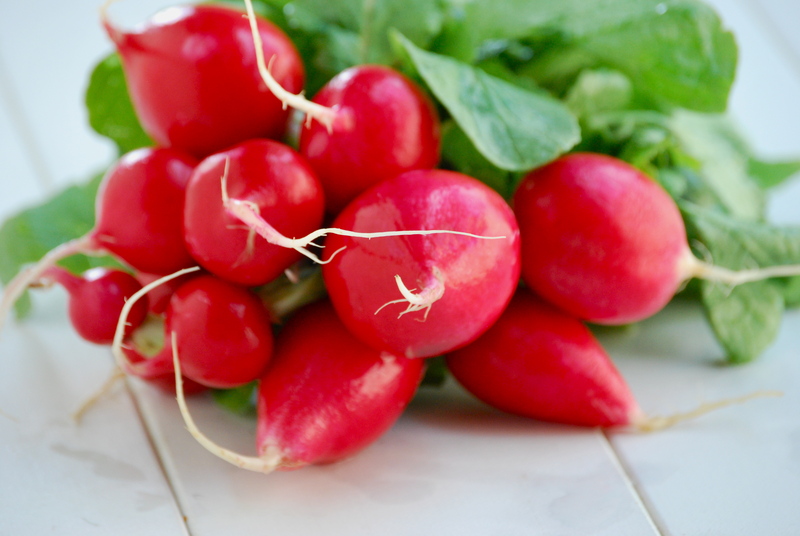 Throw a bunch crunchy radishes and a few onions on and you’re almost set. Two additional ingredients really make this salad work: the dressing– with the sublime combination of lemon and shallots– and ricotta salata cheese. This is my favorite cheese for summer salads, as it’s creamy and subtle with just the right amount of saltiness. You can substitute feta, though use the ricotta salata if you can find it. Both the dressing and the cheese balance the hearty texture and flavor of the grains, and really brighten up this salad. To make the vinaigrette: Mince the garlic and shallot and place in a bowl. Mix in the lemon juice, vinegar, and salt and let soften for about 15 minutes. After the shallots have softened, slowly whisk in the olive oil. 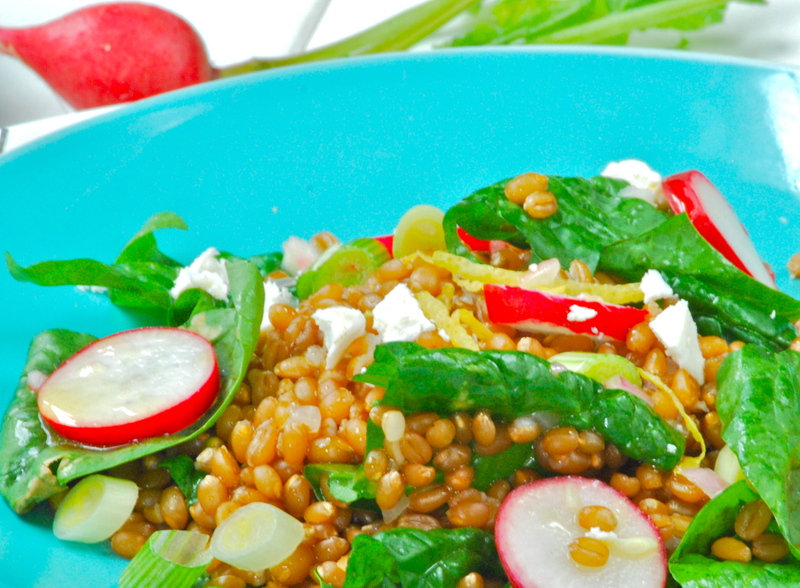 Combine the spinach, radishes, spring onion and wheat berries in a bowl. Toss with the remaining vinaigrette and top with the crumbled cheese. Enjoy and healthy eating to you all! Judging by my previous posts here (as well several others on Bliss), you probably think its all sweets at our house. Obviously I love to bake, and I generally agree that we shouldn’t deprive ourselves or our kids of these treats. Truthfully though, we eat healthy meals. I usually prepare something with fruits, vegetables, whole grains, and/or legumes. My husband can confirm that I probably make quinoa with chickpeas more often than I should. Which brings me to today’s dish. This soup is incredibly flavorful and healthy. Meatballs?! Yup. 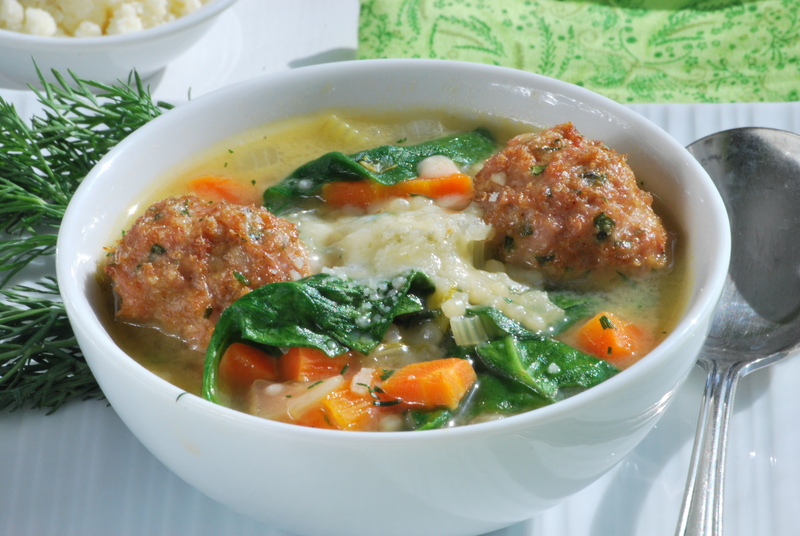 Healthy soup with meatballs? That’s right. A little background: I come from a German/Hungarian/Bohemian background. From my childhood through today, whenever my extended family gets together for a holiday, we have four different types of meatballs. Four! I’m a connoisseur. 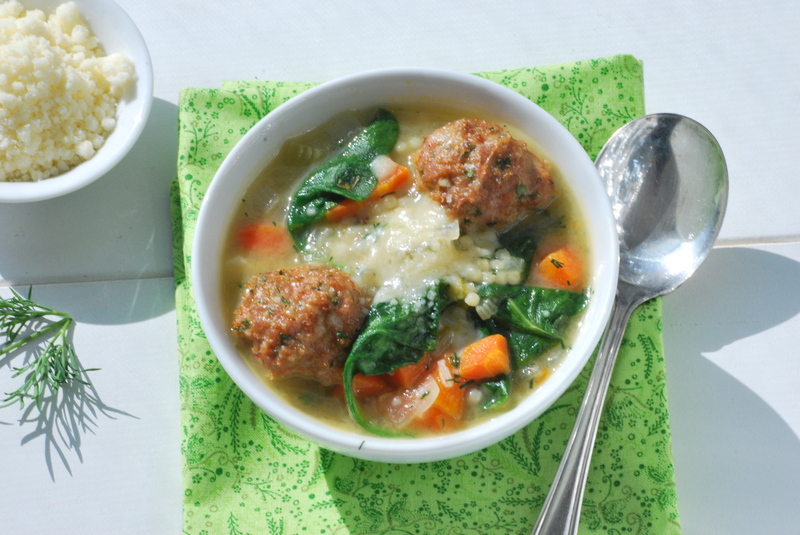 When I saw this soup– with it’s chicken meatballs (rather than the beef versions of our holiday meals)– I had to give it a try. I’ve made a few variations on the meatballs in this soup. They’re all fantastic. Ground turkey (rather than ground chicken, as in the recipe) works just fine. Also, if you can’t find chicken sausage, substitute an equal amount of ground chicken and add extra black pepper and one teaspoon each of sweet and sharp paprika to the mixture. While each is slightly different, no one version is better than the others. What about the flavor? It’s amazing. 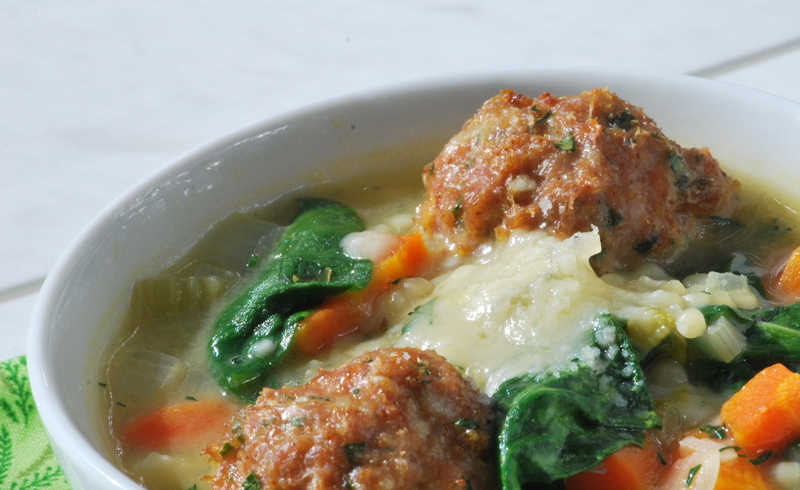 The meatballs, with their combined garlic, parsley, parmesan, and romano cheese are both savory and fresh. Fresh may sound weird, but there’s really no other way to describe how the parsley affects these little meatballs. The broth is incredible as well. The dill stands out, but it doesn’t overpower the soup. 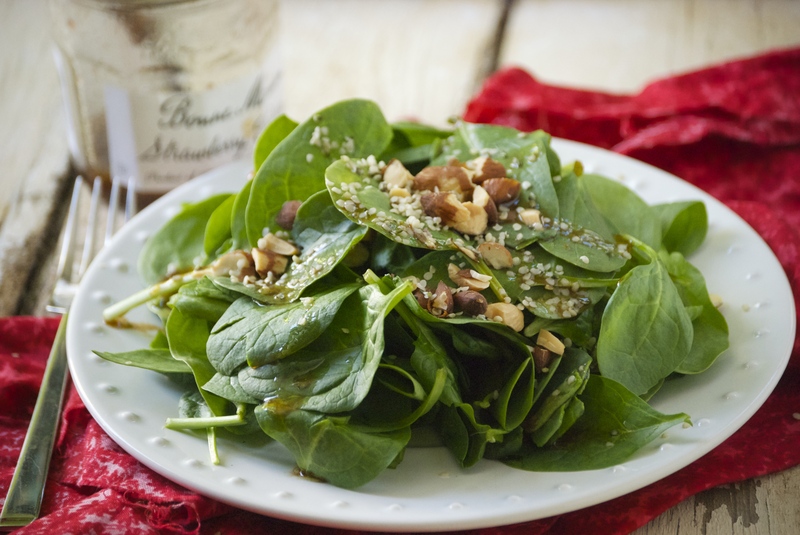 The spinach really adds to the fresh-feel of this Spring dish. Make it– you’ll be happy you did so. For the meatballs, place the ground chicken, sausage, bread crumbs, parsley, Pecorino, Parmesan, garlic, milk, egg, 1 teaspoon salt, and 1/2 teaspoon pepper in a bowl and combine gently with a fork. You should get 40 meatballs from this mixture. Make a round ball and score the meat into 4 equal parts. You will get 10 meatballs from each of them. 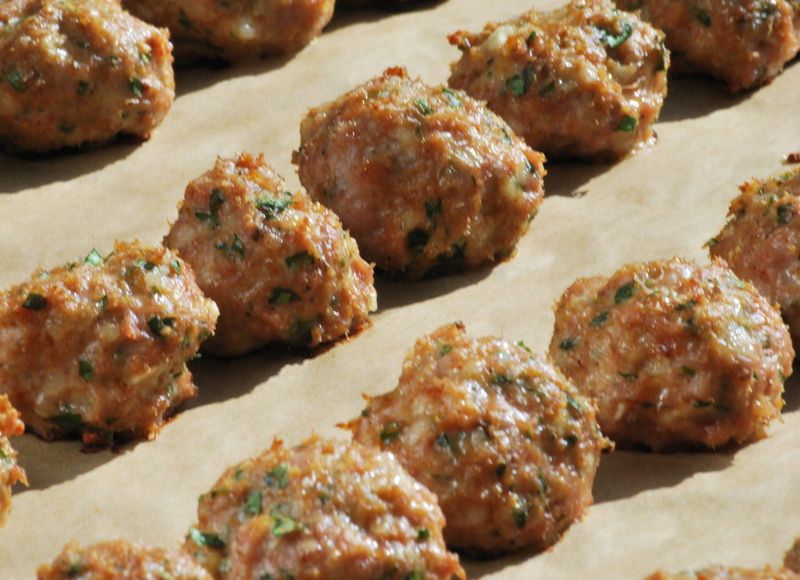 Drop meatballs onto the pan with parchment paper and bake for 30 minutes, or until cooked through and lightly browned. Set aside. In the meantime, for the soup, heat the oil over medium-low heat in a large dutch oven or soup pot. Add the onion, carrots, and celery and saute until softened, 5-6 minutes, stirring occasionally. Add the chicken stock and wine and bring to a boil. Add the pasta to the simmering broth and cook for 6-8 minutes, until the pasta is tender. Add the fresh dill and then the meatballs to the soup and simmer for 1 minute. Taste for salt and pepper. Stir in the fresh spinach and cook for another minute, until it is just wilted. Ladle into soup bowls and sprinkle with extra Parmesan cheese.